Google + Hangouts now offer group video chat, other enhancements, Google + chief posted today on Google’s blog. Here’s his full post. Google + Hangouts now include video chat around member posts, allowing members to start hangouts around posts and trigger group video chats among those who comment and others in those members’ circles, Google announced today. Google senior vp and social chief Vic Gundotra announced that enhancement and others this morning on a blog post. I include it in full below: . All too often, physical distance and frantic schedules get in the way of spending time together, especially during the holidays. But you know what? 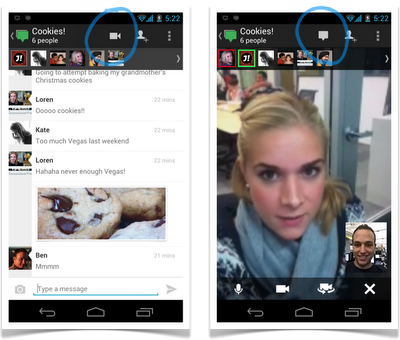 They don’t have to.With Google+ Hangouts, you can go beyond “status updates,” and connect with the people you care about using multi-person video. For free. And today we’re rolling out a number of improvements that make it even easier to say hello to your loved ones, face-to-face-to-face. Certain posts act as kindling for face-to-face interaction. Suppose your sister gets engaged, or your roommate lands a job, or your favorite singer shares their concert schedule. You can obviously write comments back and forth, but it’s moments like these when you really want to connect in person. That’s why we’re making it easy to start a hangout from any post on Google+.Just click “Hangout” underneath a post that you’re passionate about, and we’ll add your invitation to the comments. If others are hanging out already, you’ll see their invitation in the comments as well. 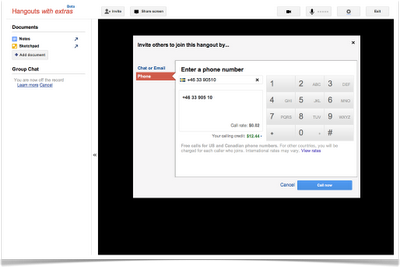 To get started, just look for the new “broadcast and record” option after starting a hangout. If you don’t see it yet, then don’t worry: we’re working hard to give everyone the chance to go On Air.In the meantime, you can still watch or join On Air broadcasts directly from the stream. Just look for the red banner while reading your posts or checking your hair, and you’ll know you’re in the right place. Dial-in friends and family, from all over the worldNot everyone has a webcam or a front-facing mobile camera, but that shouldn’t stop them from spending time with the people they’re close to. Fortunately, nearly everyone has a telephone, and today we’re making it possible to dial-in anyone, from almost any country, directly into your hangout. Calls to the U.S. and Canada are free, and international calling rates are super, super low. Whether it’s sharing baby news, or your niece’s new dance moves, Google+ users continue to use hangouts to build intimate onscreen experiences. We hope these two improvements help you discover more of them, more often.Have some fun, add some antlersBack in NMovember, we helped the Google+ community add millions of virtual moustaches to their faces. Now that it’s December we’re introducing a pair of antlers, so by all means, unleash your inner reindeer! 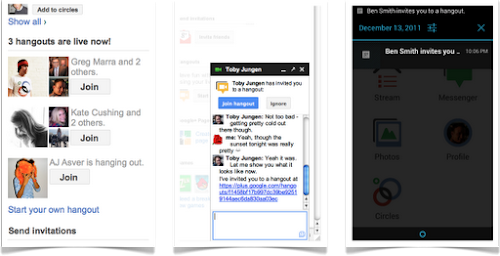 Looking ahead, developers will be able to create their own effects using the updated Hangouts API, so stay tuned for lots more fun. Ed: All above comes directly, without edit, via Google+ post by Vic Gundotra, all copy in gray is Gundotra’s. Editors here at aNewDomain will reserve opinion for our upcoming hands-on reviews.